“The first thing you notice in this hospital is that some of the theatres operate with their corridor doors open. 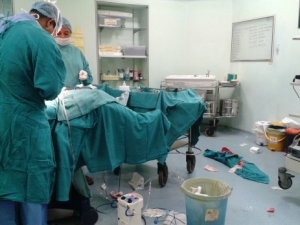 In the UK each theatre has an anaesthetic room leading to theatre and you need to pass through two doors, which shouldn’t both be open at once, to get into the theatre. In India, there are only two sinks in the corridor to scrub up in, whereas in the UK each theatre has a sink inside for you to do this. For me, the most striking thing about Indian operating theatres was just how much is reused after each procedure. The drapes and gowns worn by the theatre staff in India are all made from material that is kept at the end of surgery, washed and reused. In the UK, almost everything is disposable – gowns and drapes are all binned once the procedure is over. From a clinical perspective, the Indian procedures are the same, or very similar, as they would be in the UK, if not slightly more advanced at times. I witnessed hernia operations and a number of laparoscopic procedures. I was really privileged to have the opportunity to witness several caesarean sections, including one for twins, during my time in theatre. 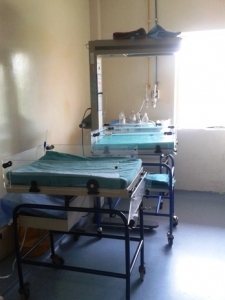 There is a separate little room in theatres for the incubator table and neonatal equipment. Being a private hospital I was able to gain some insight into the cost of procedures. Fixing a hernia with a mesh, for example, costs 43,000 rupees (approx. £500). The pharmacy is located in the theatres, which is another difference compared to the UK. The cost of drugs, or anything additional to the procedure, such as saline or antibiotics, used during the procedure would be billed and added to the patients invoice. Most wound dressings are just gauze and mepore rather than complex, or waterproof, dressings as in the UK. Most of the patients that I worked with were paying by cash, rather than relying on insurance. I also found that treatment in India, particularly some operations, could be conducted a lot quicker than in the UK. I remember that one patient, for example, presented to outpatients an hour before she was having her procedure in theatre! As a general point of note, I am in awe of the respect shown between the staff in India. Nurses are frequently referred to as sister or brother, whilst doctors are called sir or ma’am. I think this is amazing as in the UK we often call each other by first names, or you just hear the terms ‘nurse’ or ‘doctor’. I really appreciated this respectful culture, I think it is great, especially as I am not a fan of being referred to as ‘nurse’ when I am at work! Despite this, the hierarchy in theatres is clear – doctors enjoy a spacious lounge, whilst the nurses have something near to a shoe box with curtains to change behind and a table in the middle. Doctors and nurses have different coloured uniform, which I think is actually quite useful as in the UK often everyone in theatres dresses the same, making it impossible to tell who is who! Thank you, Sarah, for this excellent insight into what life is like working in an Indian hospital operating theatre. If you have medical work experience and would like to participate on this medical internship, check out our Delhi medical internship page. If you are looking to study medicine or nursing, our programme in Palampur is for you! We also offer a special versions of the Delhi and Palampur programmes that have been designed specifically for 16-18 year olds. These run on set dates during the school summer holidays and are led by one of our leaders from the UK. If you are at school and considering a career in nursing or medicine, these projects could be perfect for giving you the experience on your CV needed for your medical school application. Check out our pre medical Delhi programme and pre medical Palampur programme for more details.